A couple of weeks ago I looked at the fabulous book COLOUR by Abigail Ahern for our monthly Book Club. Since then I have been intrigued by all things colourful in the world of interiors. It’s a fun and easy task to turn your home from a neutral setting to fabulously colourful! A bold paint choice, or wild decorative piece may be exactly what you need to create an enviable rainbow-esque room, but if you’re not ready to dive straight in there are small injections of colour to be made by the addition of bright home accessories. So starting off slow, I’ve got together a collection of exciting, sophisticated and most importantly brightly coloured accessories and furnishings to show you how much fun there is to be had with the bold and beautiful. If you feel like you might need easing into the idea of eccentric and bright interiors, it’s best to go easy and introduce colour step by step with a few gleaming home accessories. These glass candle holders from Rockett St George are a great way to spice up a window sill or bare surface. The interaction between the gold and the colourful exteriors will create a warm and inviting setting in any home. Before you go in bright and beaming, opting for a more muted colourful tone is a good way to get acquainted with colour, something like these crackled, antiqued plant pots from Graham & Green will jazz up a patio area or conservatory without being too overbearing, plus they’ll make a strong canvas to continue to add colour to in the future. I’m finding it ever increasingly harder and harder to resist a bit of trim these days, so this blanket is absolutely perfect. The lovely blue tones with make a bright impact, and will be easily adapted into all sorts of colour and style schemes. Not all bold colour interiors need to consist of the bright primary colours, take a cooler, more relaxed journey with some sophisticated metallics, like this bronze Barabra chair from Sweetpea and Willow. It’s has a fantastic retro vibe going on, and will transform a simple front room into a plush cocktail lounge. When it comes to a large piece of furniture such as a dining room table, there is always an urge to stick to the status quo and go for something conventional. But if you’re interested in adding a little colour to your palette, there’s no need to go to extremes and end up with a tomato red shiny table. Find your middle ground with something like this stylish piece from Houseology. The traditional wood top combined with the playful painted legs makes a wonderful contemporary statement. When you get more comfortable with the idea of bright, colourful interiors you can really start to have some fun with the concept, from small and big ideas. If you’re thinking big, you can’t get more bright, colourful and stylish than this iconic design by Missoni from Roche Bobois. Whether you want to make a big statement or have just fallen in love with the design, it’s every colour lover’s dream. 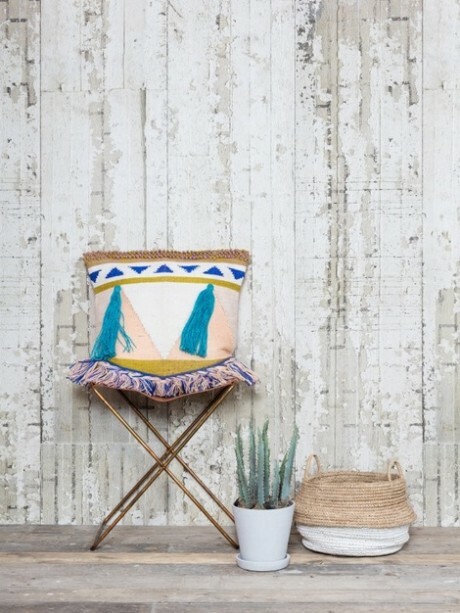 This Zulu girl cushion from Graham & Green brings a lovely regal side to the world of bright interiors, it makes the perfect scatter cushion, either in a collection of equally bold cushions or as a statement piece against a sea of neutral cushions as its backdrop. There is always something to be found from the colourful section of home accessories if you want to add a sense of humour into your interior settings. Although they might be a little too quirky for some people’s taste, this set of winking eyes is rather fun. They’re perfect for a den or bedroom and are a great way to put a smile on people’s faces. To give your table a quick fix of colourful fun, these Magritte inspired plates are a must. They’re so fabulous that they’ll even distract the guests if the dinner all goes wrong! And finally if you ever need a little colourful pick me up, this pink budgie is marvellous, hide it away in some plants or up on a shelf so that it’ll catch anyone who spots it by surprise as they walk past. Whatever your budget and whatever your taste or space requirements there is always a way to add a little brightness into your interiors and a little joy into your life!